Acting Professor of Veterinary Pathology, University of Melbourne; Farmer and Country Vet of "Bella Vista", Carapook, Casterton-Coleraine, south-west Victoria, Australia. 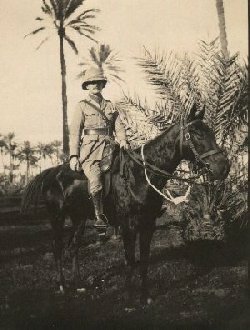 Many of his WW1 photographs from Egypt and ANZAC were complete with names and other comments. 1872 - Norman McDonald was born at Coleraine in Western Victoria, the youngest of 4 children of John McDonald, school teacher at Coleraine and Rachel McKenzie. His main residence was "Bella Vista" at Carapook, midway between the townships of Coleraine and Casterton in the Glenelg region of south-western Victoria. 1885 - his father John McDONALD 1819-1885 died at "Bella Vista" Carapook, buried Coleraine. 1885 - his mother Rachel McDONALD (nee McKENZIE) 1832-1894 died at "Bella Vista" Carapook., buried Coleraine. 1900 - his older brother John "Jack" McDONALD served in the Boer War as a Captain with the 4th New Zealand Contingent. 1911 - 1914 - Acting Professor of Veterinary Pathology, University of Melbourne. 20 Aug 1914 - joined AIF, Veterinary Officer with 2nd Field Artillery Brigade. 20 Oct 1914 - left Australia on the Transport A9 Shropshire with the 2nd Brigade. 9 Apr 1915 - "Arrived at Alexandria, 4:45 am, by train with horses and expect to embark that night." 25 Apr 1915 - landed at Gallipoli with 1st AIF as a member of the Headquarters, 2nd Field Artillery Brigade. 22 Mar 1916 - transferred to British Expeditionary Force at Alexandria. 28 Mar 1916 - disembarked at Marseilles, France. 12 Aug 1916 - attached to 21st Field Artillery Brigade from 1st Aust Div HQ. 12 Oct 1916 - admitted 10th Casualty Clearing Station in France, broken left foot. 18 Oct 1916 - embarked for England from Boulogne on "Jan Breydell"
17 Mar 1917 - discharged from 3rd London General Hospital to return to Australia on H.S. "Beltana". 12 May 1917 - returned to Australia on H.S. "Beltana" with broken leg. Post WW1 - Norman McDonald did not marry and practiced as the local Vet while residing at "Bella Vista", his property at Carapook. 11 Nov 1923 - Involved in the unveiling ceremony of the Glenelg Shire WW1 Honour Roll at the Mechanics' Hall in Casterton bearing the names of 516 soldiers who enlisted in the Shire of Glenelg, of these 108 made the supreme sacrifice and 408 returned. 1938 - Norman McDONALD was the president of the Casterton Golf Club. 28 Sep 1957 - Norman McDonald died and was buried in the Coleraine Cemetery in the family plot with granite headstones which are difficult to read.